Andrew has many years experience cooking and enjoys creating unusual meals in the kitchen. a video on how to make elderberry wine. All of these drinks have that unique delicious elderflower flavour. Enjoy! You can make a delicious champagne from elder flowers right now as the blossom from this unusual but common tree is coming into its own. The creamy, lemony-sweet-smelling flower heads can be easily identified and it doesn't take much time to pick a few, plop them in water, add a few basic ingredients and bottle their essence! The following recipe is very easy to follow and you should be able to produce a vintage product within 7 - 10 days. 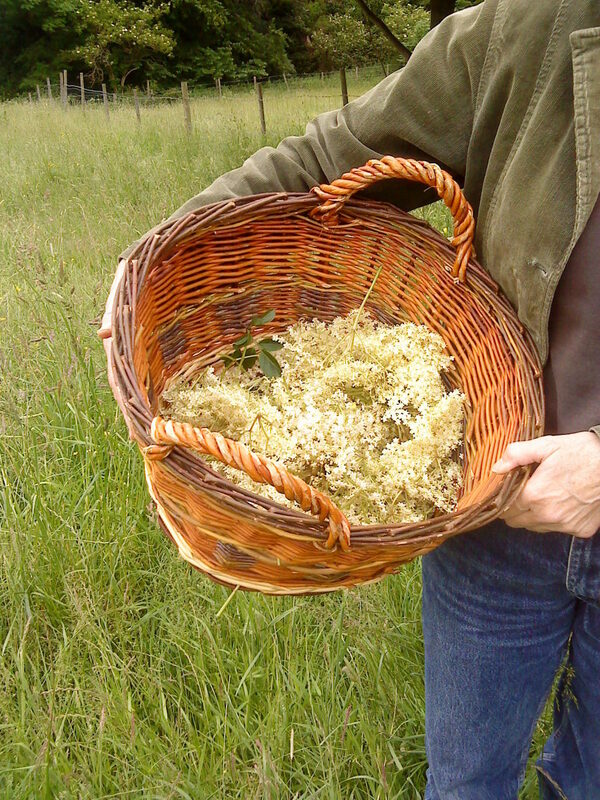 This recipe makes roughly eight one-litre bottles of elderflower champagne. If you don't fancy the bubbly stuff, you can also make a smooth cordial, just as flavoursome but non-alcoholic. 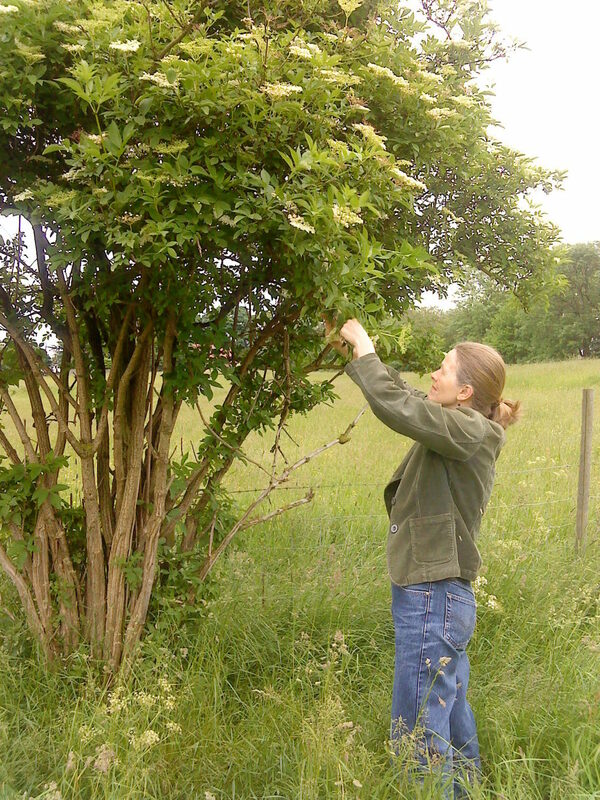 People out in the English countryside picking elder blossoms. What could be a more idyllic scene? It sounds charming and it's a fun thing to do, but there are common-sense things to think about so once you've managed to find a dry, sunny day (yes we do have them in England, about eight times a year), you'll need a basket or bag to collect the flowers. If you don't know what an elder tree looks like, check out the Sambucas nigra box below, and the photos should help you identify the right tree. watch out for bees and wasps! Gently stir the champagne mix - lemons, flowers, sugar, white wine vinegar. 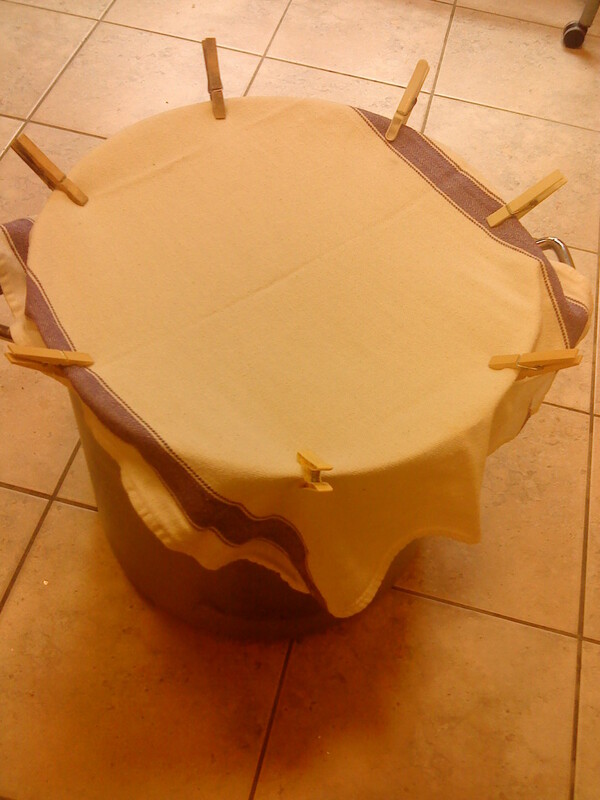 Cover with clean towel or muslin cloth and leave to ferment. Pour 8 litres of warm water into an exceptionally clean large pot or container. Add a kilogram of white sugar and stir in until dissolved. Add zest of 5 lemons then cut in half, squeeze and juice. Add the juice and lemon halves. Add 4 tablespoons of white wine vinegar. Add the 10 flower heads then gently stir the whole pot for a couple of minutes until mixed. Cover with clean muslin or towel and leave to ferment in a safe, cool space. After 24 hours, check for telltale signs of fermentation- bubbles and foam activity. Stir each day to encourage activity. Add a pinch of yeast if necessary. Don't forget to remove the flowers after 1/2 days! Leave safe to ferment further for 4/5 days then sieve and decant into strong sterilized glass bottles. As the fermentation continues, release excess pressure in the bottles by turning the screw top every so often. After one week, you should have your champagne. Serve chilled from an ice bucket. Please read through the useful tips below for more advice and information. All bottled up using a filter funnel and a variety of bottle. Use special brewer's tablets (I used Campden's) to clear murky champagne: You'll have to follow instructions for tablet use. Chilling the bottles well before serving and opening slowly keeps the fizz active. If you use a hydrometer to check the specific gravity, make sure it reaches 1010 before bottling. Sterilize bottles at 75 degrees. Clean thoroughly then pop in oven. Move your champagne mix to warmer space if there is no fermentation. Add a pinch of yeast. To slow fermentation down, put bottles in fridge. If fermentation stops add extra yeast - champagne yeast is best. Use one or two more flower heads for extra flavour. But be prepared for more fizz during fermentation. 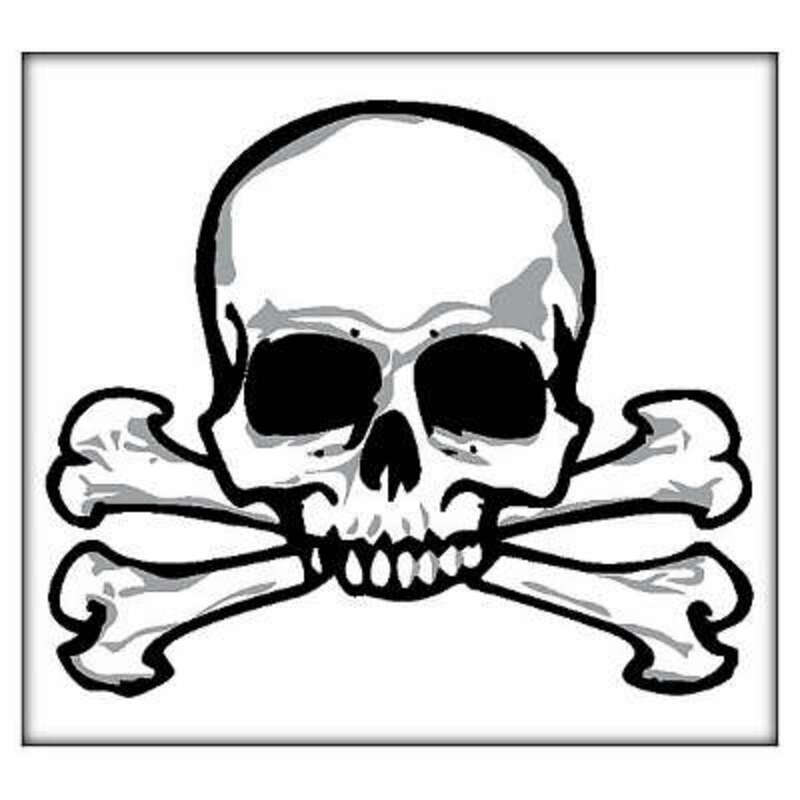 Use dextrose sugar instead of white sugar and a brewer's barrel instead of a pot. The longer you leave the bottles, the less sweet the brew will be, as sugar turns to alcohol and the champagne becomes 'dry'. Pick the flowers in full sun for best results. Alcohol content should be around 3-5% for your champagne. Should your ferment turn vinegary (which means the alcohol has oxidised), you have made a type of wine vinegar! It could be used for dressings if the taste is good. If your bottles weren't sterilised properly this could also turn it vinegary. Use a fork to remove the elder flowers. Fermentation produces a build-up of bubbles as the yeasts break down the sugars. By following these safety tips you should be able to produce a great drink and stay safe! do not let children or pets near the bottles. Cordial is made in much the same way except there is no yeast involved and therefore, in theory, no alcohol present in the end result! Clean the flower heads in water, and place in the pot with the sugar and lemons/oranges and vinegar. Pour boiling water into pot, stir until mixed, then cover securely and place in a cool safe space. Give the mixture one day for fusion. Strain and pour into sterilized bottles then chill. Enjoy with sparkling water, ice, lemon and fruits! Sambuca nigra: elder trees are common all over Europe and will grow happily by the roadside, in a hedgerow, on waste land, or on the edge of a wood. You can test to make sure you've got the right tree by taking a leaf, crushing it and smelling the strong savoury/smoky odour. The flowers have a sweet honey-like scent bordering on the fruity. In September and October, you'll see the large bunches of dark elderberries weighing the tree down as the season progresses. From these comes the rich juice, said to be medicinal. 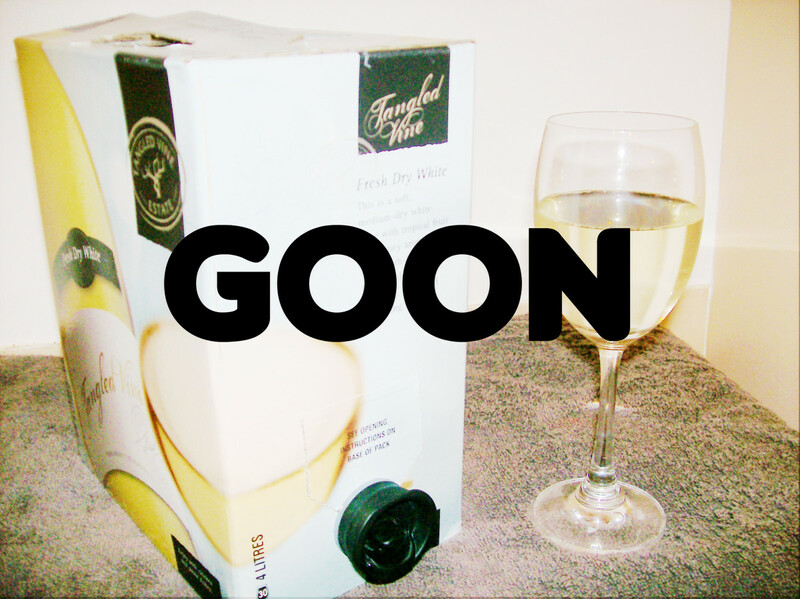 Goon: Australia's Most Famous Drink. What Is It? Is It Safe to Drink Homemade Wine? It may do, depends on ingredients. You could experiment with one bottle? Wish you well. 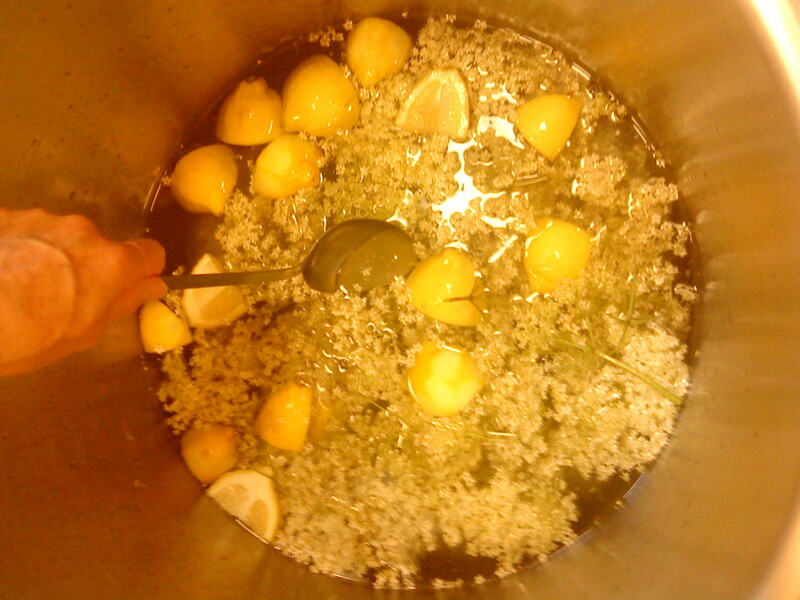 Have a batch of this started today from elderflowers picked from outside my son's school. Plan on gifting some to the teacher at the end of the school year. And with the left over heads and lemons I've make a litre of cordial. Instead of sugar in the cordial I've used a sweetener (erythritol/Stevia mix) and so far it tastes wonderful. Just wondering if the sweetener would work in the champagne or even part sugar and part sweetener? (I'm generally low carb so look for alternatives). Hope it goes to plan. Follow the tips if you need them - sterile bottles a must. Chilled, with lemon on a hot day - so nice. Thank you so much Andrew. I'll try pouring it through a filter. Sediment is natural and best left to settle or you could try using a filter when pouring. How do I stop the sediment from rising up when I open the bottle? It spoils my champagne, or maybe I'm Doing something wrong? 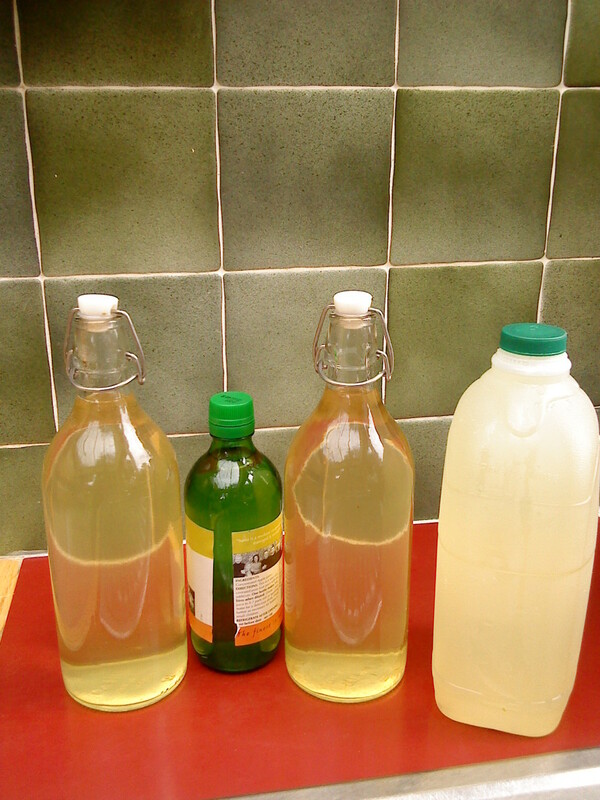 Yes Imogen, there's nothing like the taste of your own home made elderflower champagne! I love the whole process - from collecting the flowers to pouring the final drop. Thank you for the visit and comment, much appreciated. 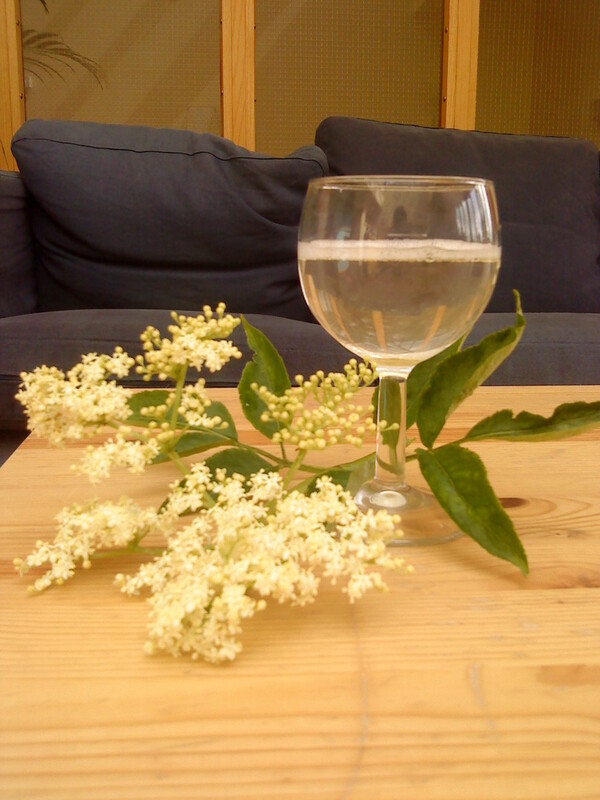 I love elderflower champagne, and have made it myself a couple of times. The elderflowers are just starting to come out here now so think it might be time to get another batch going soon. Thanks for the clear instructions and tips. When i go back to England, my mum has bottles of this in store. It is a real childhood memory from when we used to make it. At the moment in the UK elderflower has become really popular, flavoring cakes etc. Many thanks for the visit and comment. I hope one day you might be able to have a go at making this wonderful drink! I have often wondered about the secrets of making champagne, as I really love drinking it.. probably I will experiment one day even if it looks quite difficult to make .. I don't know if I'll be able to follow your recipe here in Southern California, but I did find your article to be very interesting. Well done! That's really unique. Cool recipe. I'd like to try some but I'm not sure I'd trust myself to make my own. I'll pass this along and maybe someone will make me some! Thank you Peggy W. Elder trees are very common around where we live and are considered a nuisance by some - they invade gardens and hedgerows and the like. Not sure if they reached the USA! You could check the latin name out to see if it's been introduced. I don't know that I have ever seen an elder tree but found this hub fascinating in any case. This should be a contender for certain in the current HP contest for the drink section. Good luck! Voted up, useful and interesting. Yep that's right they do resemble mountain ash (or rowan as the scots call them) blossom - both with a special scent and both bearing berries that are used for juice and jelly! The birds love rowan berries and gobble them up like nobody's business when they ripen to a beautiful matt orange colour.. I'd love to see a moose at 'em! The recipe is almost idiot proof, you just have to be a bit careful with sterilizing and bottling. The quaffing is easiest! Wow, you make this look so easy! The elder look a lot like the mountain ash that grew in my parent's front yard (and the moose used to devestate every spring). Nicely presented and well done. Voted up and more. This is so fascinating. I've yet to see real elderflowers but by the pictures, they're beautiful. I can only imagine how nice it would taste. Very well organized and I totally enjoyed reading it. Rated up. This is a very well-organized hub and the subject is fascinting. It should be a good condidate for the recipe contest, too! We don't have elder trees here, but I remember seeing them in the countryside where I grew up. Thank you for sharing your photos and recipe.